When I come home from NYC to visit my parents in Chicago my mom always leaves me flowers next to my bed. It’s such a sweet and kind gesture that means so much to me. It’s the little things like this that really make you stop and think and be thankful for the beautiful things in life. Always remember to be grateful! 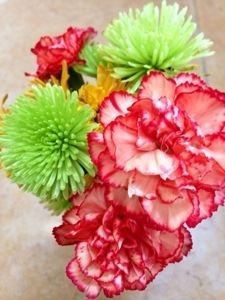 The green mum flowers really brighten the whole flower arrangement!